The greatest minds that this realm has ever seen now exist among us. These mortal men are not gods, but it would be easy to mistake them as such, given the fact that they are the ones who are ever pushing us onward, into a brighter, better and more powerful future. These minds reside in many towns, across many Kingdoms, but all are a part of the "Academy", an institution where thinking is allowed and encouraged. 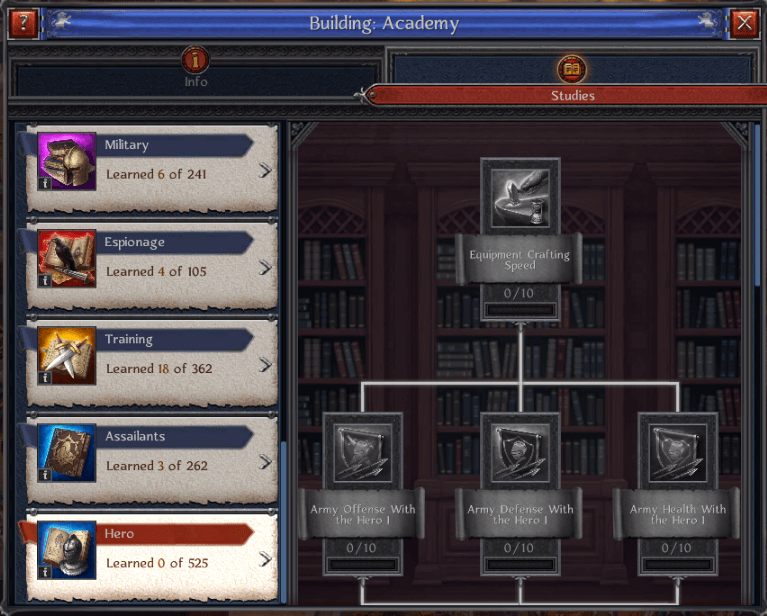 Each town has an Academy, and each Academy has its scholars, some of which are better than others, but each play an important role nonetheless, through their combined knowledge. 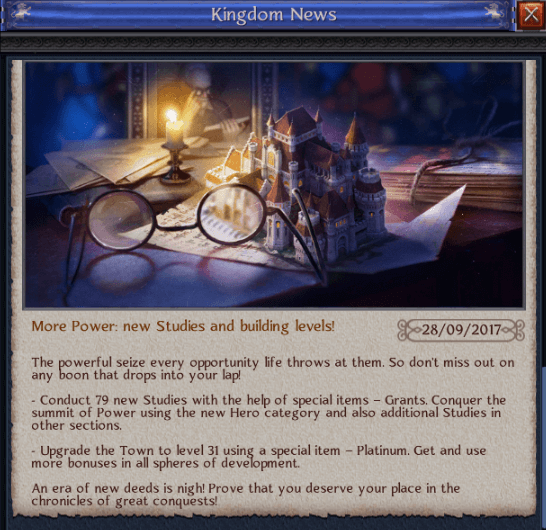 This knowledge grows daily and when a new set of advancements are learned, they are rolled out and announced for the entirety of the realm to learn about. This is exactly what we recently watched unfold. Titled simply "More Power", the name summarizes these advancements perfectly, for that is primarily what they focus on. Within the Academy, a whole new category has been unlocked, known as the "Hero" category. The amount of knowledge possessed within this one category alone is stunning, with 525 advancements to learn about. This is truly one of the greatest leaps forward that we have ever seen within mankind's history. 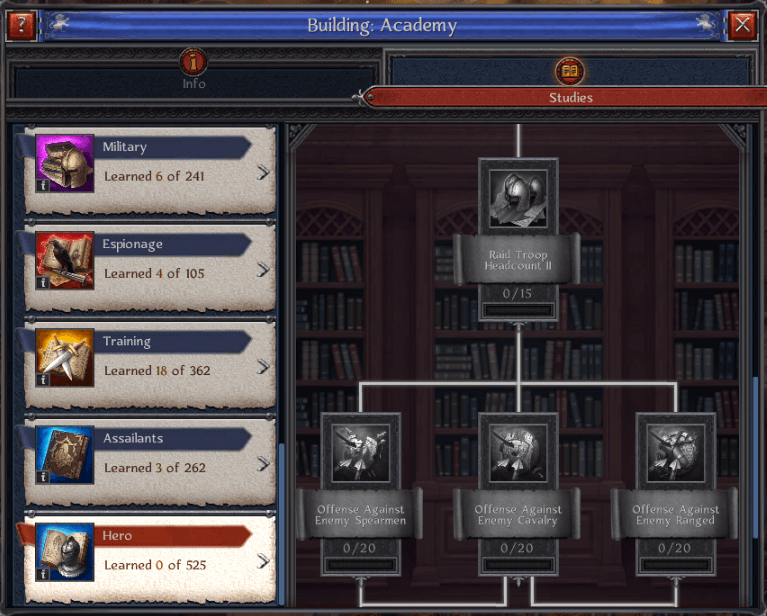 As can be seen from the sample shown above, this category focuses upon knowledge that will primary increase the strength of your army and its fighting forces, making you that much more superior over your enemies, who are yet to unlock these new skills. Yet this is no simple task. It will take years to unlock all the skills possessed within this category. 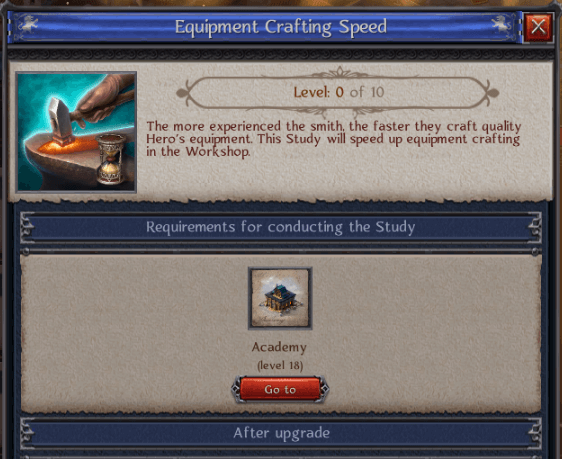 To start, you must have an Academy of level 18 to even begin to travel down this road to greater knowledge. This news alone would have been spectacular on its own, but it does not end here. 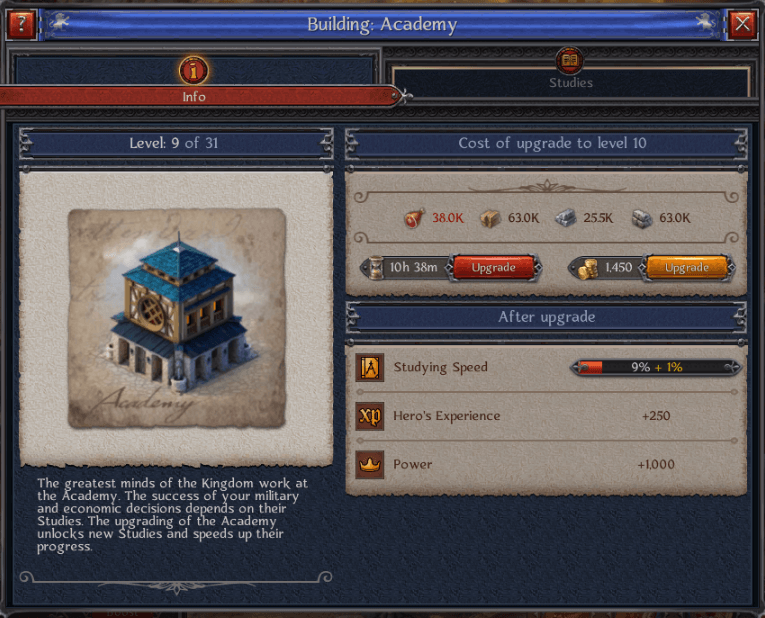 In addition to this new category of knowledge, Lords can now advance their buildings to a maximum level of 31, meaning that they will unlock even more wealth and power through building up the production capabilities of their towns. The race is now on to see who will accomplish all of these advancements first, and thus gain the upper hand over their enemies and foes in the lands of Throne: Kingdom at War.